By 1970, Led Zeppelin had been crowned rock royalty. They were up there with the biggest names in rock music. No wonder. Their first two albums had sold over twenty-three million copies. The new four years would be a game-changer for Led Zeppelin. Over the next five years, Led Zeppelin would become the biggest band in the world. Led Zeppelin’s influence would increase. They would become one of the most influential groups of the seventies. This lead to a change in Led Zeppelin. Their dress style became flamboyant and they travelled everywhere by their own private jet, The Starship. Then there was the rock ’n’ roll lifestyle. Led Zeppelin revelled in the rock ’n’ roll lifestyle. Led Zeppelin lived the rock ’n’ roll dream. Drink, drugs and debauchery was commonplace. So was destruction. The four members of Led Zeppelin weren’t averse to wrecking hotel rooms. Having trashed a room in the Tokyo Hilton, Led Zeppelin were banned from the chain for life. Hotel rooms weren’t just trashed. Television sets out of hotel windows. Another time, John Bonham rode a motorcycle the Continental Hyatt House, which Led Zeppelin nicknamed Riot House. However, when it came time to recording an album, Led Zeppelin put their game head on. So when the time came to record Led Zeppelin III, which was recently rereleased by Atlantic Records as a double album, Jimmy Page and Robert Plant headed to rural Wales. Their destination was a remote cottage in Bron-Yr-Aur. This was where Robert Plant’s family used to holiday in the fifties. It became the place where Jimmy Page and Robert Plant came to write and unwind after tours. They did this for Led Zeppelin III. For Led Zeppelin III, Jimmy Page and Robert Plant wrote Immigrant Song, Friends and That’s The Way. Jimmy Page and Robert Plant cowrote Celebration Day, Since I’ve Been Loving You and Bron-Y-Aur Stomp with John Paul Jones. John Bonham cowrote Out On The Tiles with Jimmy Page and Robert Plant. Other tracks included the Jimmy Page penned Tangerine, a cover of Gallows Pole and Hats Off to (Roy) Harper arranged by Jimmy Page and Robert Plant. These ten tracks became Led Zeppelin III. Recording of Led Zeppelin III took place at various studios in the UK and USA. This included Olympic Studios and Basing Street Studios in London. Other recording session took place at Headley Grange Manor in Hampshire. It was a rather dilapidated mansion. It benefited from a laid-back atmosphere. This was perfect for recording Led Zeppelin III. Rather than record the album in one go, sessions took place between January and August 1970. In between, Led Zeppelin toured their eponymous debut. They were, after all, on their way to becoming one of the biggest rock bands of the first half of the seventies. The constant touring helped further hone Led Zeppelin’s sound when they entered the studio. For the recording of Led Zeppelin III, Jimmy Page played acoustic, electric and pedal steel guitar, plus banjo and dulcimer. The rhythm section included John Paul Jones who played bass, double bass, organ, Moog synth and mandolin. John Bonham played drums and percussion. Robert Plant delivered his usual series of vocal powerhouses and played harmonica on the album that became Led Zeppelin II. It was released in October 1970. Exactly a year had passed when Led Zeppelin III was released in October 1970. Led Zeppelin III marked a change in Led Zeppelin’s music. There was a move towards folk rock and acoustic music. This surprised critics. They gave Led Zeppelin III indifferent views. For Led Zeppelin, this was nothing new. They’d never been the critic’s choice. Instead, Led Zeppelin were hard living musical outlaws. However, Led Zeppelin III showed a different side to their music. There was a reason for this. Every member of Led Zeppelin played their part in the writing of Led Zeppelin III. It seemed Led Zeppelin was becoming a democracy. No longer were Jimmy Page and Robert Plant the main songwriters. John Bonham and John Paul Jones played their part in Led Zeppelin III. It was a much more eclectic album than their first two hard rocking albums. This resulted in Led Zeppelin’s music appealing to a much wider range of record buyers. Despite this, Led Zeppelin III didn’t enjoy the same commercial success as Led Zeppelin’s first two albums. Led Zeppelin III reached number one in the UK and spent three weeks at the top of the charts. Over the Atlantic, Led Zeppelin III reached number one in the US Billboard 200, where it spent four weeks. It even reached number thirty in the US R&B charts. Across the world, Led Zeppelin III was a huge commercial success. In the UK, Led Zeppelin III was certified platinum and in America, Led Zeppelin III was certified platinum six times over. Led Zeppelin III was certified triple platinum in Australia and Canada and platinum in Argentina and France. Gold discs came Led Zeppelin III’s way in Germany, Netherlands, Spain and Switzerland. Despite all the gold and platinum discs, Led Zeppelin III didn’t sell as many copies as Led Zeppelin’s two previous albums. Although that was disappointing. That wasn’t the end of the commercial success. Despite Led Zeppelin’s strict no singles policy, Immigrant Song was released as a single. It peaked at number sixteen in the US Billboard 100 charts. 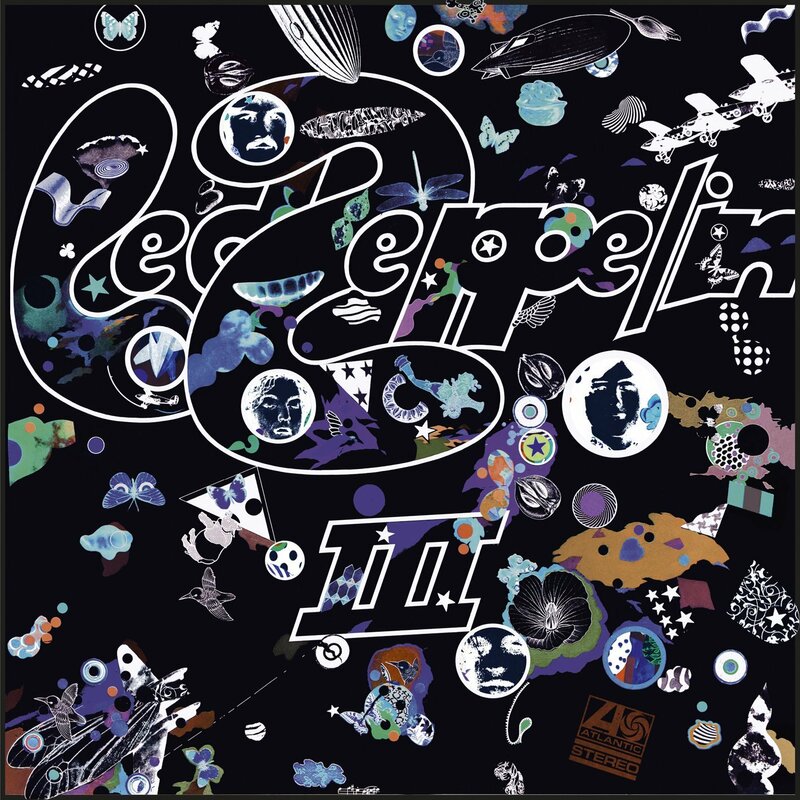 Immigrant Song is also the song that opened Led Zeppelin III. Against a backdrop of studio chatter, Friends unfolds. An acoustic guitar is joined by percussion as the arrangement unfolds. When Robert’s vocal enters, he sings about friendship and its importance. His vocal is restrained and enveloped by strings and harmonies. It’s totally unlike what we’ve come to expect from Led Zeppelin, but shows they’re no one trick pony. The introduction to Celebration Day is a combination of a bluesy and experimental sound. Jimmy plays his guitar at breakneck speed and a Moog synth adds a futuristic sound. Then it’s all change. Led Zeppelin unleash their unique brand of good time rock ’n’ roll. They swagger their way through the track, riffing, blistering guitars join forces with the rhythm section. The guitars are at the heart of the track. They’re tuned to a standard and then open tuning. This is a masterstroke. Adding the finishing touch is Robert’s urgent, strutting vocal. A crystalline guitar opens Since I’ve Been Loving You. It adds a bluesy hue. Then the rhythm section join. They lock into a groove, allowing Jimmy’s guitar to play a leading role. Later, a Hammond organ enters. Not long after that Led Zeppelin begin to stretch their legs. It looks as if they’re about to kick loose. That’s not the case. Robert’s weary vocal enters. He’s been working “seven till eleven.” His vocal is tinged with emotion. She’s been messing with his mind and he’s scared she’ll leave him. Almost spent, his vocal drops out, allowing a guitar masterclass from Jimmy to take charge. When Robert’s vocal returns, it’s a mixture of raw power, emotion and sadness as Led Zeppelin continue to seamlessly mix blues, rock and drama effortlessly. Out On The Tiles could’ve been Led Zeppelin’s theme tune. In Britain, a night on the tiles is slang for a night on the town. This is fitting. Led Zeppelin were about to embark upon their wild years. During these years, this driving, rocky, everyman anthem could just as well be Led Zeppelin’s theme tune. Gallows Pole is an oft-covered traditional folk song. One of the earliest versions was by blues legend Leadbelly. Given that Led Zeppelin were huge blues fans, that’s maybe where they first heard the song. It’s a song of two parts. The first part is acoustic. Just an acoustic guitar accompanies Robert’s powerhouse of a vocal. After that, the arrangement builds and builds. Instruments are dropped in and the arrangement builds. Thundering drums, mandolin and Robert’s grizzled vocal. He struts and swaggers his way through the lyrics defiantly, breathing new life into the track. After a false start, Tangerine gets underway. Just a strummed twelve-stringed acoustic guitar hesitantly introduces Robert’s vocal tender, hurt-filled vocal. Soon, guitars reverberate and the rhythm section provide the backdrop to what’s best described as a fusion of folk rock and country. Latterly, the country sound shines through. There’s a nod to Neil Young. Especially given the addition of the pedal steel and harmonica. This shows another side to Led Zeppelin, as they become a musical chameleon. That’s The Way is another acoustic guitar lead track. It’s joined by a mandolin and pedal steel. They provide a mellow backdrop to Robert’s vocal. His vocal is a mixture of hurt and dread. He’s been hurt by his cheating partner and is dreading telling her their relationship is over. There’s even a psychedelic twist to the track. Especially with lyrics like “yesterday I saw you kissing tiny flowers, but all that lives is born to die” after that Robert becomes nihilistic when he sings: “and so I say to you nothing matters, and all you do is stand and cry.” These are some of the best lyrics on Led Zeppelin III, on a track that’s laid-back, mellow and beautiful. Bron-Y-Aur Stomp sees another change of tack from Led Zeppelin. Just a noodling acoustic guitar and spoons combine with castanets. It’s Led Zeppelin as you’ve never heard them. Then comes the big bass drums and Robert’s vocal. His vocal is veers between restrained to raw power. handclaps, drums, acoustic guitar and percussion accompany him. John Paul Jones plays a five string fretless bass. Despite using the unlikeliest instruments, producer Jimmy Page moulds them together seamlessly. Closing Led Zeppelin III is Hats Off To (Roy) Harper. The track is a medley of fragments of blues songs and lyrics. It’s a case of spot the blues track. One of the most recognisable is Bukka White’s Shake ‘Em, Down. Delivering the lyrics is a modern day bluesman, Robert Plant. Along with Jimmy Page’s guitar, Robert plays an important part in Led Zeppelin’s homage to blues music and a modern day folk singer. That however, isn’t the end of Atlantic Records recently rereleased version of Led Zeppelin III. It’s a luxuriously compiled double album. On disc two, which entitled Companion Audio, there’s alternate mixes of Immigrant Song and Celebration Day. There’s rough mixes of Since I’ve Been Loving You, Gallows Pole, That’s The Way and Jennings Farm Blues, which evolved out of Bron-Y-Aur Stomp. Other tracks include a version of Friends with no vocal and a rough mix of Key To The Highway/Trouble In Mind. 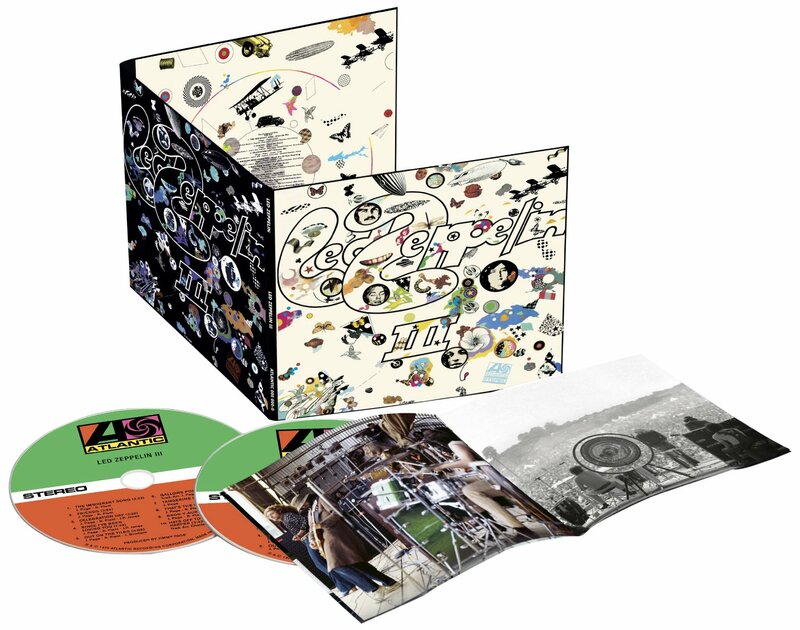 Each of these tracks are a snapshot of Led Zeppelin III at an important part of their career. Led Zeppelin III marked a change in sound from Led Zeppelin. After releasing two albums that sold twenty-three million copies, Led Zeppelin decided to move away from their tried and tested fusion of blues, folk, psychedelia and rock. This was brave. After all, Led Zeppelin had found a winning formula. Why change. The reason for that, was Led Zeppelin were musical innovators. They wanted to challenge themselves. So they changed direction. A year after the release of their sophomore album Led Zeppelin II, Led Zeppelin III was released in October 1970. Led Zeppelin III marked a change in Led Zeppelin’s music. There was a move towards folk rock and acoustic music. There was even a country twist to Led Zeppelin III. Led Zeppelin hadn’t turned their back on blues, rock and psychedelia. 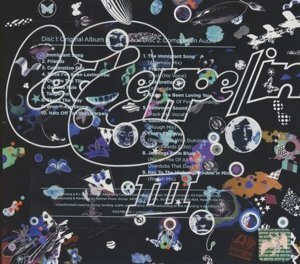 As a result, Led Zeppelin III was the most eclectic album of their three album career. This surprised critics. Critics gave Led Zeppelin III indifferent views. For Led Zeppelin, this was nothing new. They’d never been the critic’s choice. It seemed Led Zeppelin couldn’t win as far as the critics were concerned. They disliked their first two albums. The critics believed that neither Led Zeppelin nor Led Zeppelin II offered nothing new. Now Led Zeppelin tried to move forward musically, they still felt the wrath of the critics. Robert Plant took this badly. He never spoke to the press for eighteen months. Even when Led Zeppelin released Led Zeppelin IV, he refused to talk to the critics. However, just like their first two albums, belatedly, critics revised their opinion of Led Zeppelin III. Just like many other times, collective amnesia struck music critics. Many of the critics that panned Led Zeppelin III, wrote fawning articles praising the album. What they wrote was what many music fans already knew. Led Zeppelin III was a classic album. Since its release in 1970, music critics have been frantically backtracking. Now, when they mention Led Zeppelin III, critics make sure to call it a classic album. Belatedly, they were right. Originally, music fans didn’t seem to appreciate the quality of Led Zeppelin III. It didn’t sell as many copies as their first two albums. Music lovers didn’t seem to enjoy Led Zeppelin III as much as their first two albums. Having said that, it still sold by the millions. Gold and platinum discs aplenty came Led Zeppelin’s way. After Led Zeppelin III, Led Zeppelin became the world’s biggest and most successful rock band. By 1970, Led Zeppelin were seen as rock royalty. They were up there with the biggest names in rock music. No wonder. Their first two albums had sold over twenty-three million copies. The new four years would be a game-changer for Led Zeppelin. After Led Zeppelin III, Led Zeppelin had sold nearly thirty million copies. Their lives were transformed. Over the next five years, Led Zeppelin would become the biggest band in the world. Led Zeppelin’s influence would increase. They would become one of the most influential groups of the seventies. This lead to a change in Led Zeppelin. Their dress style became flamboyant and they travelled everywhere by their own private jet, The Starship. They indulged in the rock ’n’ roll lifestyle. Most importantly, Led Zeppelin released some of the best music of the seventies, includes Led Zeppelin III. ← THE MASQUERADERS-EVERYBODY WANNA LIVE ON.